SiriOm Singh draws on his skill as a kundalini yoga teacher and musician to create unique workshops that focus on initiating the self, opening up the heart, creating communication and accessing the power of the Universe. These 1½ hour classes include warm up, a kriyas – exercise sequences focusing on a different aspect of the mind/body, deep relaxation and mantra chanting. The classes are open to all levels. For those who prefer a class at their home or business, alone or in a small group, SiriOm is available to bring the class to you. These classes can be tailored to the specific needs of the student. For a fuller experience of kundalini yoga, SiriOm offers a variety of longer workshops ranging from 3 hours to 3 day retreats. Each workshop focuses on a specific area in life. We look outside of ourselves for our identity and our power. This workshop teaches the participants how to access their inner power and possibility. The true self is not who we see in the mirror. Our true self, which resides in our third chakra (energy center) is who we really are. This workshop teaches the participants how to access the true self and find answers from within to life situations. The aura, the magnetic field, is the projection of our inner strength and balance and the shield that protects us from harmful agents in our environment. This workshop teaches the participants how to achieve energy, health, happiness and success. An opportunity for participants to relax, refresh, revitalize, connect to their true self and inner wisdom, balance their minds and access their full potential. The 3 hour workshops include warm up, specific kriyas, gong meditation, mantra chanting and deep relaxation. Full day workshops (8 hours) include also mindfulness practice, eating meditation, and mantra and mudra meditation. Three day retreats include also walking meditation and healing circle. Meditation is a tool of active listening that promotes harmony between the inner realm and the outer realm, and connects us to true reality and to the source of our power. We tend to think of meditation as a state of physical stillness. This 3 hours workshop is taught together with Ayala Shimelman MA OTR CHT, certified hypnotherapist, certified empowerment coach and certified stress management consultant. Together they provide an augmented experience that far surpasses the effect of each technique alone. Yoga is not meant to practice just on the mat. Yogic principles are good guidelines to follow in everyday living. 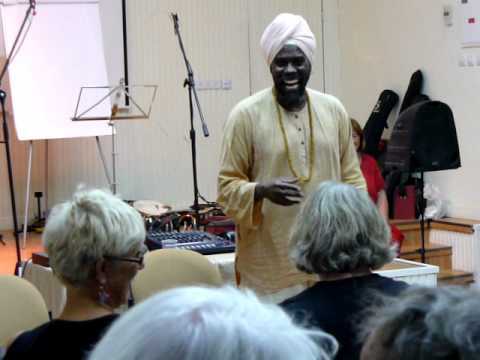 SiriOm combines his skills as yoga teacher, percussionist and singer in these workshops that are designed to enhance the experience of life – open communication, open heart, happiness and a sense of fulfillment. The most ancient musical instruments are the body and the drum. Drumming is a sacred and ancient art of communication and transformation and used to evoke inner power. Soul Rhythm combines yogic principles and technology, meditation practice and drumming to deepen awareness, facilitate listening and enhance the skill of inviting and including others in constructive communication. Participants learn to use the “body drum”, vocalization and breath sounds to discover their individual rhythm, and to create new ways of communicating with others in a non-verbal, meaningful and uplifting manner. 3 hours class, including introduction; light yoga and breathing exercises; introduction to the use of the body as a drum; discovering the personal rhythm and group improvisation; discussion and suggestions for applications in daily communication. 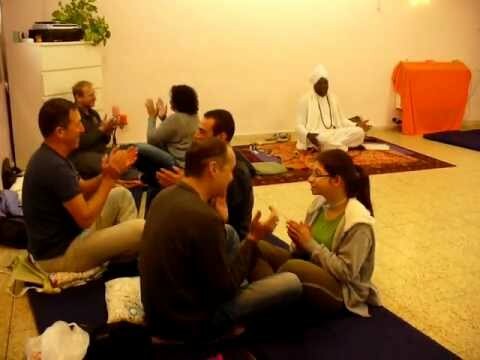 Full day workshop (8 hours), including introduction; light yoga; meditation and breathing exercises; exploration of using the body, the voice and the breath as a drum; expanding the concept of personal rhythm; group drumming and improvisation; discussion and suggestions for applications in daily communication. What is the thing that will cause us to experience happiness, contentment, fulfillment? Will we experience it when we achieve our dream job? Our dream car or house? Our dream relationship? Will we then experience Love fully? This workshop uses two technologies: Naad Yoga – the yoga of sound, the technology of using vibration. Mudra Meditation – hand positions that are used in yogic science to activate specific areas of the brain and connect the individual with cosmic energy. Together they transcend the human condition and create an ecstatic experience of uniting mind and body, self and others, human and the divine. 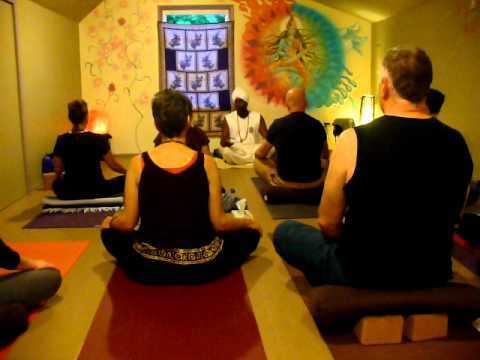 The 3 hour class includes introduction, several active meditations, chanting and satsang. Participants learn to use meditation with mantra, mudra – hand position, music and their voice to become present, to distinct between love for objects and things and love that comes from divine source, to fully realize their life, and to project their inner light. A powerful class of self discovery and a moving and inspiring spiritual experience. Previous experience of meditation or musical talent not necessary. This workshop is geared toward those who have little or no experience, or those who want to hone those drumming skills. 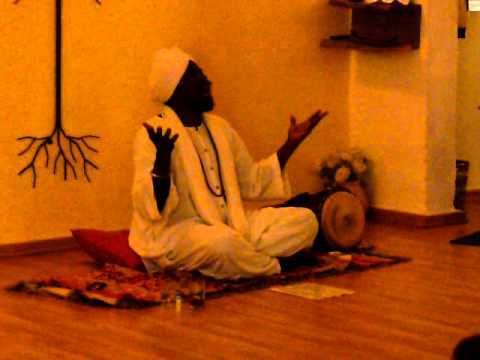 SiriOm teaches how to hold a drum and how to create the basic sounds. Participants learn to listen to and bring out their individual rhythm, and to create a group rhythm. This workshop is designed for anyone who wants to enhance and tone their voice, for singing or speaking. Through breathing and voice exercises participants learn to increase breath control, achieve precision and enhance projecting.